"There was a small village in North Karnataka with a population of five to eight thousand.It boasted of a beautiful lake with a temple on its shore. The area was dotted with trees." so begins Sudha Murthy's book "House of cards". What I enjoy most about Sudha Murthy's book is the endearing glimpse into villages and towns of Karnataka. These descriptions are so pleasing to the heart,they have to be read to be enjoyed. Like this one-"The Full Moon day was celebrated with great joy and all relatives and friends came together for moon light dinner at the side of the lake or mango groove." If your are a lover of such descriptive tales then you will enjoy this and other books of Sudha Murthy. Coming to the story of the 'House of Cards', it's the story of Mridula who stays in the village of Aladhalli. Mridula even though born to a well to do family, is brought up in the most simple lifestyle and beliefs. Mridula's traits of austerity and frugality is interesting and a pleasant change in this material world where joys are associated with material things. She doesn't have love for anything material, yet loves and lives life to the fullest. A line oft repeated in the book is how it seemed the sun rose for her only and the rainbow colors were meant for her only. Mridula enjoys life in her village,teaching, cooking and sketching. Mridula finds a husband like herself, who has less demands and needs from life. They move to the city and from there life begins to change for them. Mridula's husband, a doctor, who serves patients considering it as his duty eventually succumbs to the cruel ways,demands and pressures of the rat race. If we can't race ahead,we will be left far behind is what he experiences, hence he too leaps in race and eventually succeeds. New found success and wealth brings many changes in her life. To read more about that and how she deals with them read the "House of Cards"
Comments for A Review of "House of Cards" by Sudha Murthy. It is a wonderful book. Many characters where so similar that anyone can related with this book. People changes with time that's fact. Book is simple and love the description about village and when mridula swing near temple. a beautifully written novel by Mrs Sudha Murthy...its a relfection of Many indian ladies who crave for affection and love from their family members...MONEY is essential in life, but it often brings unhappiness in realtionships. ITS A FANTASTIC BOOK WRITTEN BY SUDHA MURTHY. a very real story i have seen in most of the indian homes.thanks 2 madam sudha murty for this novel.i am sad thinking that this is a real story of one of a girl . 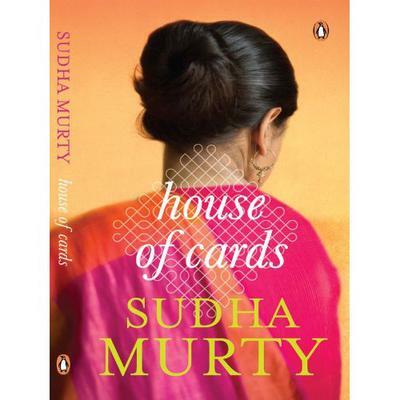 "House of Cards" is a book written by Sudha Murthy. The review of this book shows us the old village of North Karnataka which is famous because of its beauty. This place is doted with trees and have a beautiful lake with a temple in its middle. This village is kind of a house with different characters and tells us how everyone sails in the life. Nice book. Love the way Smt. Sudha writes. Its a house of different characters and how each one sails in life. Thanks for the comment Lakshmi.I have liked all her books so far! Glad to read your feed back Zaree.